Mary Keitany during her world record (Women's only race) in the 2017 London Marathon with 2:17:01. 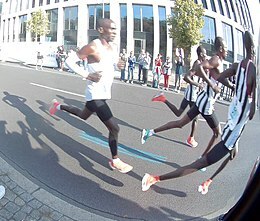 Eliud Kipchoge (left) and his three pacemakers (right) during the Marathon world record in the 2018 Berlin Marathon with 2:01:39. "The start and finish points of a course, measured along a theoretical straight line between them, shall not be further apart than 50% of the race distance." "The decrease in elevation between the start and finish shall not exceed an average of one in a thousand, i.e. 1m per km." In recognizing Kenyan Geoffrey Mutai's mark of 2:03:02 at the 2011 Boston Marathon as (at the time) "the fastest Marathon ever run", the IAAF said: "Due to the elevation drop and point-to-point measurements of the Boston course, performances [on that course] are not eligible for World record consideration." Road racing events like the marathon were specifically excepted from IAAF rule 260 18(d) that rejected from consideration those track and field performances set in mixed competition. The Association of Road Racing Statisticians, an independent organization that compiles data from road running events, also maintains an alternate marathon world best progression but with standards they consider to be more stringent. Performances claiming world best or world record status on "point-to-point" courses such as the Boston Marathon have historically been rejected by USA Track & Field. Performances on these courses could be aided by slope and/or tailwinds. The IAAF Congress at 2011 World Championships in Athletics passed a motion changing the record eligibility criteria effective January 2012, so that women's world records must be set in all-women competitions. The result of the change was that Radcliffe's 2:17:42 performance at the 2005 London Marathon would supplant the existing women's mark as the "world record"; the earlier performance was to be referred to as a "world best". The decision was met with strong protest in Britain, and in November 2011 an IAAF council member reported that Radcliffe's original mark would be allowed to stand, with the eventual decision that both marks would be recognized as "world records," the faster one as a "Mixed Gender" mark, the other as a "Women Only" mark. In December 2016, Nike, Inc. announced that three top distance runners—Eliud Kipchoge, Zersenay Tadese and Lelisa Desisa—had agreed to forgo the spring marathon season to work with the company in an effort to run a sub-two-hour marathon, though a detailed plan to complete the marathon in 1:59:59 or faster was not released. The Breaking2 event took place in the early morning of May 6, 2017; Kipchoge crossed the finish line with a time of 2:00:25. This time was more than two minutes faster than the world record, but was not an official world record. Among other factors, specialized pacers were used, entering the race midway to help Kipchoge keep up the pace. Marathon races were first held in 1896, but the distance was not standardized by the International Association of Athletics Federations (IAAF) until 1921. The actual distance for pre-1921 races frequently varied slightly from the present figure of 42.195 km (26 miles 385 yards). In qualifying races for the 1896 Summer Olympics, Greek runners Charilaos Vasilakos (3:18:00) and Ioannis Lavrentis (3:11:27) won the first two modern marathons. On April 10, 1896, Spiridon Louis of Greece won the first Olympic marathon in Athens, Greece in a time of 2:58:50; however, the distance for the event was reported to be only 40,000 meters. [nb 1] Three months later, British runner Len Hurst won the inaugural Paris to Conflans Marathon (also around 40 km) in a time of 2:31:30. In 1900, Hurst would better his time on the same course with a 2:26:28 performance. [nb 2] Later, Shizo Kanakuri of Japan was reported to have set a world record of 2:32:45 in a November 1911 domestic qualification race for the 1912 Summer Olympics, but this performance was also run over a distance of approximately 40 km. [nb 3] The first marathon over the now official distance was won by American Johnny Hayes at the 1908 Summer Olympics. In the 1953 Boston Marathon, the top three male finishers were thought to have broken the standing world record, but Keizo Yamada's mark of 2:18:51 is now considered to have been set on a short course. The Boston Athletic Association does not report Yamada's performance as a world best. On October 25, 1981, American Alberto Salazar and New Zealander Allison Roe set apparent world bests at the New York City Marathon (2:08:13 and 2:25:29); however, these marks were invalidated when the course was later found to have been nearly 150 meters short. Although the IAAF's progression notes three performances set on the same course in 1978, 1979, and 1980 by Norwegian Grete Waitz, the Association of Road Racing Statisticians considers the New York City course suspect for those performances, too. On April 18, 2011, the Boston Marathon produced what were at that time the two fastest marathon performances of all time. Winner Geoffrey Mutai of Kenya recorded a time of 2:03:02, followed by countryman Moses Mosop in 2:03:06. However, since the Boston course does not meet the criteria for record attempts, these times did not get ratified by the IAAF. Eight world records have been set at the Polytechnic Marathon (1909, 1913, 1952–54, 1963–65). World records have been broken at all of the original five World Marathon Majors on numerous occasions; eight times at the Berlin Marathon, three times at the Boston Marathon, and four times each at the Chicago, London, and New York City Marathons. However, the records established in the Boston event have been disputed on grounds of a downhill point-to-point course, while three of the four New York records have been disputed on grounds of a short course. United States July 24, 1908 London, United Kingdom IAAF Time was officially recorded as 2:55:18 2/5. Italian Dorando Pietri finished in 2:54:46.4, but was disqualified for receiving assistance from race officials near the finish. Note. United States January 1, 1909 Yonkers,[nb 5] United States IAAF Note. United States February 12, 1909 New York City, United States IAAF Note. United States May 8, 1909 New York City, United States IAAF Note. United Kingdom May 26, 1909[nb 6] Polytechnic Marathon, London, United Kingdom IAAF Note. Sweden August 31, 1909 Stockholm, Sweden IAAF Note. United Kingdom May 12, 1913 Polytechnic Marathon IAAF Note. 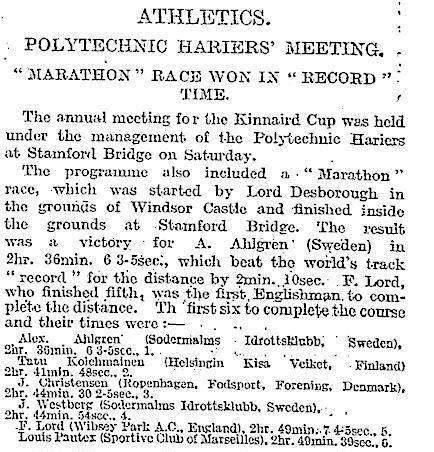 Sweden May 31, 1913 Polytechnic Marathon IAAF Report in The Times claiming world record. Note. Finland August 22, 1920 Antwerp, Belgium IAAF, ARRS The course distance was officially reported to be 42,750 meters/26.56 miles, however, the Association of Road Racing Statisticians estimated the course to be 40 km. United States October 12, 1925 Port Chester, United States IAAF Note. Japan March 31, 1935 Tokyo, Japan IAAF According to the Association of Road Racing Statisticians, Suzuki's 2:27:49 performance occurred in Tokyo on March 21, 1935, during a race in which he finished second to Sohn Kee-chung (sometimes referred to as Kee-Jung Sohn or Son Kitei) who ran a 2:26:14. Japan April 3, 1935 Tokyo, Japan IAAF Note. 2:26:42 Sohn Kee-chung Japanese Korea November 3, 1935 Tokyo, Japan IAAF Note. Korea April 19, 1947 Boston Marathon IAAF Disputed (short course). Disputed (point-to-point). Note. United Kingdom June 14, 1952 Polytechnic Marathon IAAF, ARRS MarathonGuide.com states the course was slightly long. Report in The Times claiming world record. 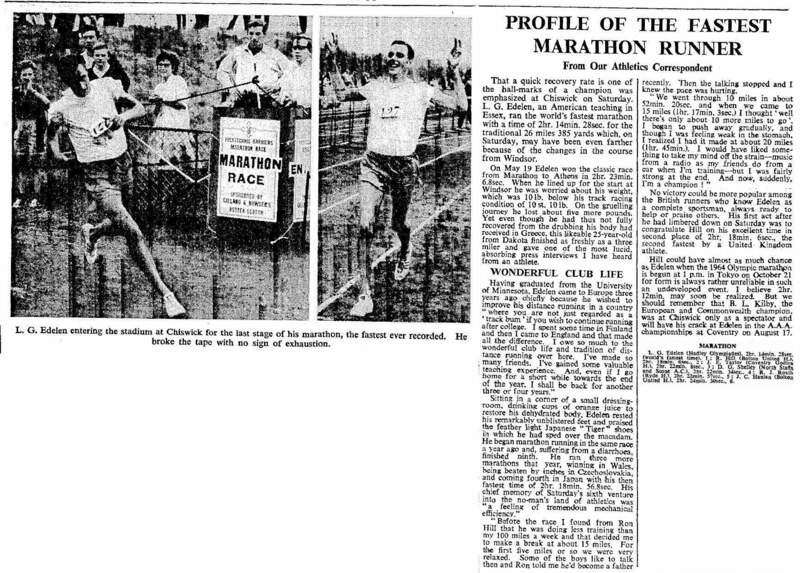 United Kingdom June 13, 1953 Polytechnic Marathon IAAF, ARRS Report in The Times claiming world record. United Kingdom June 26, 1954 Polytechnic Marathon IAAF Point-to-point course. Report in The Times claiming world record. United States June 15, 1963 Polytechnic Marathon IAAF Point-to-point course. Report in The Times claiming world record and stating that the course may have been long. United Kingdom June 13, 1964 Polytechnic Marathon IAAF Point-to-point course. Report in The Times claiming world record. Japan June 12, 1965 Polytechnic Marathon IAAF Point-to-point course. Report in The Times claiming world record. Australia May 30, 1969 Antwerp, Belgium IAAF Disputed (short course). Kenya September 28, 2003 Berlin Marathon IAAF, ARRS First world record for the men's marathon ratified by the International Association of Athletics Federations. United Kingdom October 3, 1926 London [nb 7] IAAF The ARRS indicates that Piercy's 3:40:22 was set on August 2, 1926, during a time trial on a course that was only 35.4 km. United States December 16, 1963[nb 8] Culver City, United States IAAF Disputed (short course). West Germany April 21, 1975 Boston Marathon IAAF Disputed (point-to-point). Norway October 22, 1978 New York City Marathon IAAF Disputed (short course). Norway October 21, 1979 New York City Marathon IAAF Disputed (short course). Norway October 26, 1980 New York City Marathon IAAF Disputed (short course). New Zealand October 25, 1981 New York City Marathon IAAF Disputed (short course). United States April 18, 1983 Boston Marathon IAAF Disputed (point-to-point). ^ The Association of Road Racing Statisticians has estimated the course distance to be 37–38 km. ^ According to the "Sporting Records" section of The Canadian Year Book for 1905: "Len Hurst won the Marathon race, 40 kilometres (24 miles, 1505 yards), over roads, Conflans to Paris, Fr., in the record time of 2.26:27 3-5, July 8, 1900." Other sources confirm that the direction of the 1900 race was reversed but note Hurst's finishing time as 2:26:47.4 or 2:26:48. ^ Road running historian Andy Milroy writing for the Association of Road Racing Statisticians has indicated that "25 miles was the distance of the first Japanese marathon held in 1911". Predating Kanakuri's performance, Milroy also indicated that a "professional world record" at the 25 mile distance of 2:32:42 was set by British runner Len Hurst on August 27, 1903. ^ According to the Association of Road Racing Statisticians, Beames' performance of 2:46:30 on August 31, 1971, in Werribee, Australia is regarded as a time trial. ^ Many references incorrectly refer to this race as the Yonkers Marathon. The Yonkers Marathon, which during the early 1900s was traditionally run during late November, was won over a month earlier by Jim Crowley. ^ According to the progression of world bests listed by the International Association of Athletics Federations (IAAF), James Clark set a world best of 2:46:52.8 in New York on February 12, 1909, Albert Raines broke Clark's mark with a 2:46:04.6 in New York on May 8, 1909, and Henry Barrett broke Raines' mark with a 2:42:31.0 in London on May 26, 1909. Ian Ridpath, a former director of the Polytechnic marathon, has indicated on his website that some sources have wrongly listed the date of Barrett performance as May 26, 1909, and has confirmed the true date as May 8, 1909. An article in The Times dated May 10, 1909, provides strong evidence that Ridpath is correct. Given that Barrett's marathon in London most likely concluded before Raines' marathon held on the same date in New York, it is also likely that Barrett rather than Raines broke the world best set by Clark three months earlier. ^ Piercy's mark was set on the Polytechnic Marathon course between Windsor and London. 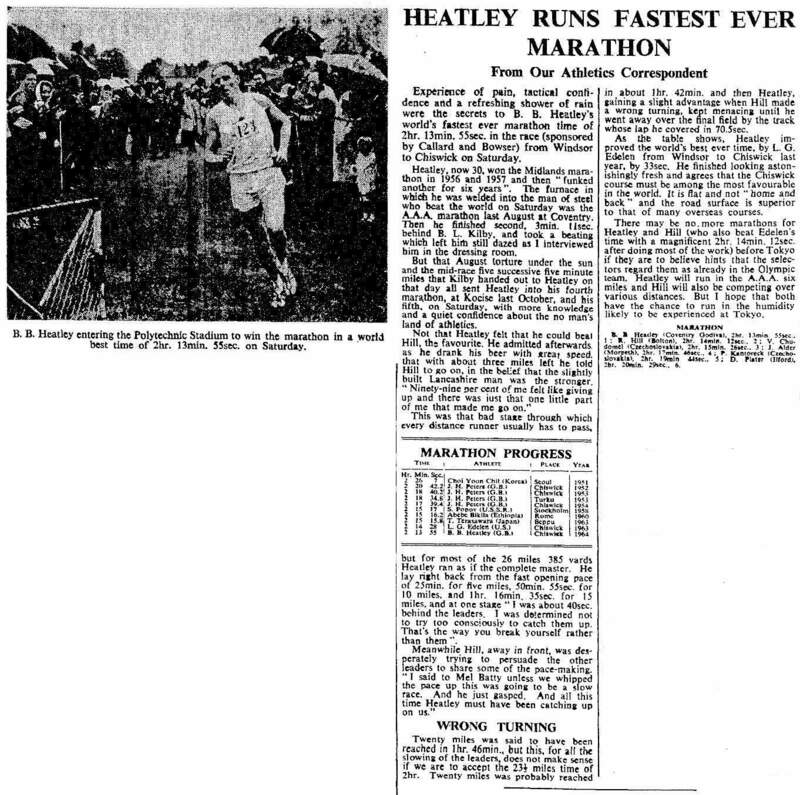 A number of sources, including Kathrine Switzer, have reported that the venue for Piercy's mark was the actual Polytechnic Marathon, however, records from the Association of Road Racing Statisticians confirm that the 1926 Polytechnic Marathon was held on May 18. ^ The Association of Road Racing Statisticians notes the date of the race as December 14, 1963. ^ a b Peter Heidenstrom, a statistician for Athletics New Zealand, has been reported as providing a date of December 1964, however, the Association of Road Racing Statisticians notes the date of Sampson's performance was August 16, 1964. Other sources from August to October 1964 support the August date. The ARRS also notes that Sampson's mark was set during a time trial and does not recognize it in their progression of marathon world bests. ^ a b "World Records ratified". IAAF. October 26, 2018. Retrieved October 28, 2018. ^ a b "Stats/Records by Event/Marathon". Monaco: International Association of Athletics Federations. Retrieved September 29, 2011. ^ "Kipchoge a 'happy man' in Monza". Monaco: International Association of Athletics Federations. Retrieved May 12, 2017. ^ "Women's outdoor Marathon - Records - iaaf.org". iaaf.org. ^ "Interactive: A look at how three marathoners could break the sub-2hr barrier on May 6". The Straits Times. Retrieved May 12, 2017. ^ a b c d "IAAF Competition Rules 2016-2017" (PDF). 2015. p. 275. Retrieved November 11, 2015. ^ "IAAF Publication, "The Measurement of Road Race Courses", Second Edition, 2004, Updated 2008" (PDF). Retrieved March 17, 2010. ^ Monti, David (April 18, 2011). "Strong winds and ideal conditions propel Mutai to fastest Marathon ever - Boston Marathon report". www.iaaf.org. International Association of Athletics Federations. Retrieved February 26, 2014. ^ a b c d e f g h i j k l m n o p q r s t u v w x y z aa ab ac ad ae af ag ah ai aj ak al am an ao ap aq ar as at au av aw ax ay az ba bb bc bd be bf bg bh bi bj bk bl bm bn bo bp bq br bs bt ARRS World Best Progressions - Road 2015. ^ "Association of Road Racing Statisticians". ARRS. January 1, 2003. Retrieved November 11, 2015. ^ Rosenthal, Bert (April 14, 1990). "Boston Marathon: For the record, race doesn't measure up". The Free-Lance Star. Fredricksburg, Virginia. AP. p. 13. Retrieved August 20, 2012. ^ "OTR04WomenSup.qxd" (PDF). Retrieved March 17, 2010. ^ a b Baldwin, Alan (September 20, 2011). "Argument erupts over Radcliffe's marathon record". Reuters. Reuters. Retrieved September 29, 2011. ^ "Paula Radcliffe keeps her marathon world record in IAAF about-turn". The Guardian. London. November 10, 2011. ^ Ed Caesar (December 12, 2016). "Inside Nike's Quest for the Impossible: a Two-Hour Marathon". Wired'. Retrieved December 12, 2016. ^ Alex Hutchinson (December 12, 2016). "Nike's Audacious Plan: Break the 2-Hour Marathon Barrier in 2017". Runner's World. Retrieved December 15, 2016. ^ Ross Tucker, Ph.D. (December 13, 2016). "The sub-2 hour marathon in 2017? Thoughts on concept". The Science of Sport'. Retrieved December 15, 2016. ^ Jon Mulkeen (May 6, 2017). "Kipchoge a 'happy man' in Monza". IAAF. Retrieved May 6, 2017. ^ "The Marathon journey to reach 42.195km". european-athletics.org. April 25, 2008. Retrieved February 26, 2014. ^ Martin, Dr. David (2000). "Marathon running as a social and athletic phenomenon: historical and current trends". In Pedoe, Dan Tunstall (ed.). Marathon Medicine. London: Royal Society of Medicine Press. p. 31. ISBN 9781853154607. ^ De Coubertin, Pierre; Timoleon J. Philemon; N. G. Politis; Charalambos Anninos (1897). "The Olympic Games, B.C. 776 - A.D. 1896, Second Part, The Olympic Games in 1896" (PDF). Charles Beck (Athens), H. Grevel and Co. (London). Retrieved October 16, 2008. ^ "Athletes | Olympic Medalist | Olympians | Gold Medalists | Medal Count". Olympic.org. July 19, 1996. Retrieved September 26, 2011. ^ Milroy, Andy. "The origins of the marathon". Association of Road Racing Statisticians. Retrieved July 29, 2010. ^ "Sporting Records". The Canadian Year Book for 1905. Toronto Canada: Alfred Hewitt. 8: 147. 1905. ^ Martin, David E.; Roger W. H. Gynn (May 2000). The Olympic Marathon. Human Kinetics Publishers. p. 37. ISBN 978-0-88011-969-6. ^ Noakes, Tim (2003). The Lore of Running (Fourth ed.). Oxford University Press. ISBN 0-87322-959-2. ^ "Running Training Blog Entry | Lydiard Foundation Members". Lydiardfoundation.org. July 15, 1912. Archived from the original on March 2, 2012. Retrieved September 26, 2011. ^ "ARRS - Association of Road Racing Statisticians". ^ "Profiles - Johnny Hayes". Running Past. Retrieved March 17, 2010. ^ Tarasouleas, Athanasios (October – November 1997). "Stamata Revithi, "Alias Melpomeni"" (PDF). Olympic Review. 26 (17): 53–55. Retrieved May 19, 2010. ^ "Tour de Paris Marathon". Arrs.net. May 28, 2011. Retrieved September 26, 2011. ^ Fast Tracks: The History of Distance Running Since 884 B.C. by Raymond Krise, Bill Squires. (1982). ^ Howe, Charles. "Out of the bushes, ahead of the ambulance, and into the spotlight: milestones in the history of women's (mostly distance) running, Part I" (PDF). Rundynamics. Retrieved February 26, 2014. ^ "Boston Marathon history - Boston Globe". Boston.com. Retrieved March 17, 2010. ^ 114th B.A.A Boston Marathon Official Program. April 19, 2010. ^ a b c d e "New York City Marathon". Association of Road Racing Statisticians. Retrieved July 29, 2009. The course used for the 1981 race was remeasured at 42.044 km or 151 meters short of the full marathon distance. Since a major part of the shortness was within the Central Park portion of the course, all "five borough" races prior to 1981 must also be considered suspect (1976–1980) and are not considered acceptable for statistical purposes. ^ a b "The Polytechnic Marathon 1909–1996". Ianridpath.com. Retrieved June 2, 2010. ^ a b c d e f g h i j k l m n o p q r s t u v w x y z aa ab ac ad ae af ag ah ai aj ak al am an ao ap aq ar as at au av aw ax ay az ba bb bc bd be bf bg bh bi bj bk bl bm bn bo bp bq br bs bt IAAF Statistics Handbook - Daegu 2011. ^ Cook, Theodore Andrea (1909). "The Fourth Olympiad being The Official Report The Olympic Games of 1908" (PDF). The British Olympic Association, London. Archived from the original (PDF) on September 27, 2007. Retrieved November 11, 2015. ^ "Athletes | Olympic Medalist | Olympians | Gold Medalists | Medal Count". Olympic.org. July 19, 1996. Archived from the original on May 20, 2009. Retrieved September 26, 2011. ^ a b c d e f "Men's World Record Times - 1905 to 1911". Marathonguide.com. Retrieved March 17, 2010. ^ Association of Road Racing Statisticians. Yonkers Marathon. Retrieved May 15, 2010. ^ "J.F. CROWLEY WINS YONKERS MARATHON; Irish-American Runner Leads Big Field Over Westchester County Roads". New York Times. November 27, 1908. p. 7. Retrieved May 15, 2010. ^ "12th IAAF World Championships In Athletics: IAAF Statistics Handbook. Berlin 2009" (PDF). Monte Carlo: IAAF Media & Public Relations Department. 2009. p. Page 565. Archived from the original (PDF) on August 6, 2009. Retrieved November 11, 2015. ^ "Image: 1909Timesreport.jpg, (550 × 1188 px)". ianridpath.com. Retrieved September 15, 2015. ^ a b "Men's World Record Times - 1910 to 1916". Marathonguide.com. Retrieved March 17, 2010. ^ "Image: 1913Timesreport.jpg, (434 × 452 px)". ianridpath.com. Retrieved September 15, 2015. ^ "Olympic Games Official Report 1920" (PDF). Archived from the original (PDF) on April 8, 2008. Retrieved March 17, 2010. ^ "Men's World Record Times - 1922 to 1928". Marathonguide.com. October 12, 1925. Retrieved March 17, 2010. 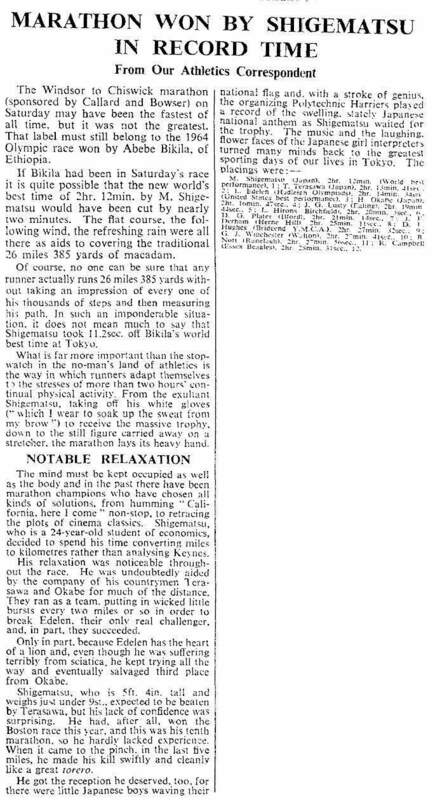 ^ "World Marathon Rankings for 1935". Arrs.net. Retrieved March 17, 2010. ^ a b "Men's World Record Times - 1932 to 1938". Marathonguide.com. Retrieved March 17, 2010. ^ a b c The Association of Road Racing Statisticians does not consider performances on the Boston Marathon course to qualify for world record status due to the possibility that they could be aided by slope and/or tailwinds. (See .) This mirrors the IAAF's current criteria regarding record eligible courses. ^ "Men's World Record Times - 1944 to 1950". Marathonguide.com. April 19, 1947. Retrieved March 17, 2010. ^ "Men's World Record Times - 1949 to 1955". Marathonguide.com. Retrieved March 17, 2010. ^ a b "Image: 1952Timesreport.jpg, (359 × 1700 px)". ianridpath.com. Retrieved September 15, 2015. ^ "Image: 1954Timesreport.jpg, (339 × 1244 px)". ianridpath.com. Retrieved September 15, 2015. ^ "Image: 1963Timesreport.jpg, (1733 × 1242 px)". ianridpath.com. Retrieved September 15, 2015. ^ "Image: 1964Timesreport.jpg, (1362 × 1353 px)". ianridpath.com. Retrieved September 15, 2015. ^ "Image: 1965Timesreport.jpg, (704 × 1260 px)". ianridpath.com. Retrieved September 15, 2015. ^ "Del's Athletics Almanac Olympics Commonweath European World Championship Results [Event Information]". Athletics.hitsites.de. Archived from the original on February 28, 2009. Retrieved November 11, 2015. ^ "Makau stuns with 2:03:38 marathon world record in Berlin | iaaf.org". IAAF. September 25, 2011. Archived from the original on 2011. Retrieved November 11, 2015. ^ "World records ratified | iaaf.org". IAAF. December 20, 2011. Archived from the original on 2011. Retrieved November 11, 2015. ^ a b c d e "World Best Progression- Road". ARRS. May 3, 2016. Retrieved January 3, 2019. ^ "Kipsang sets world record of 2:03:23 at Berlin Marathon | iaaf.org". IAAF. September 29, 2013. Retrieved November 11, 2015. ^ "World Record Ratified | iaaf.org". IAAF. November 12, 2013. Retrieved November 11, 2015. ^ "Kimetto breaks marathon world record in Berlin with 2:02:57 | iaaf.org". IAAF. September 28, 2014. Retrieved November 11, 2015. ^ "World Record Ratified | iaaf.org". IAAF. November 24, 2014. Retrieved November 11, 2015. ^ "Eliud Kipchoge sets new marathon world record". BBC Sport. September 16, 2018. Retrieved September 16, 2018. ^ Noakes, Tim (2003). The Lore of Running (Fourth ed.). Oxford University Press. p. 675. ISBN 0-87322-959-2. ^ "Washington Running Report - Feature Article". Runwashington.com. February 23, 1981. Archived from the original on September 30, 2011. Retrieved September 26, 2011. ^ a b c "Western Hemisphere Marathon". Association of Road Racing Statisticians. Retrieved November 11, 2015. ^ "World Marathon Rankings for 1963". Association of Road Racing Statisticians. Retrieved November 11, 2015. ^ Jutel, Anne-Marie (2007). "Forgetting Millie Sampson: Collective Frameworks for Historical Memory". New Zealand Journal of Media Studies. 10 (1): 31–36. Archived from the original on July 24, 2011. ^ a b "World Marathon Rankings for 1964". Association of Road Racing Statisticians. Retrieved July 29, 2009. Note: Mildred Sampson (NZL) ran 3:19:33 in a time trial on 16 Aug 1964 at Auckland NZL. ^ "Housewife's Marathon Record Run". The Age. Melbourne. August 18, 1964. p. 22. Retrieved May 21, 2010. ^ Rogin, Gilbert (October 5, 1964). "The Fastest Is Faster". Sports Illustrated. Archived from the original on March 5, 2010. Retrieved May 21, 2010. One Saturday last August, a Mrs. Millie Sampson, a 31-year-old mother of two who lives in the Auckland suburb of Manurewa, went dancing until 1 am The next day she cooked dinner for 11 visitors. In between, she ran the marathon in 3:19.33, presumably a record. ^ "IAAF Statistic Handbook Beijing 2015". IAAF. 2015. Retrieved April 23, 2017. 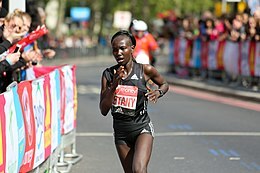 ^ "Keitany breaks women's-only world record at London Marathon". IAAF. April 23, 2017. Retrieved April 23, 2017. "untitled". ARRS. Retrieved November 11, 2015. Butler, Mark, ed. (2011). 13th IAAF World Championships in Athletics - IAAF Statistics Handbook - Daegu 2011 (PDF). Part 5 (of 5). IAAF Media & Public Relations Department. pp. 595, 612, 614–615, 705, 707. Retrieved November 11, 2015.